Ok, so there have been a number of new commercial roguelike and roguelike-like games coming out recently, mostly on desura, and quite a few of them have been appearing in bundles, so I thought I’d start reviewing them, if only so that you can save your money and play soup. Perhaps also it will discourage some people from charging money for games they really shouldn’t be charging money for. in bundle? : yes, http://indiebundle.org/the-hellish-dungeons-bundle/ $7 for 5 games. 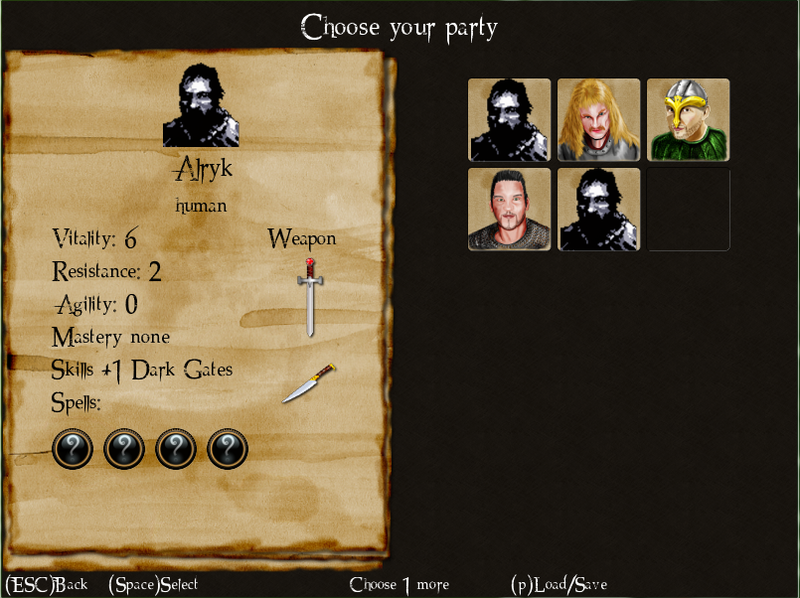 You start off by having to pick 6 adventurers to send into the dungeon. They have different weapons and different what looks like number of spells and different stats. You immediately notice that the graphics are of the hand-drawn and not that good variety. The desperate, melted faces look up at you, pleading with you not to send them into the jaws of death. “Never mind!” I happily tell them, “At least your face won’t get any more messed up if someone swings a sword into it or throws a fireball at it”. I used to be normal! Then I became a “hero”. Please make me normal again! 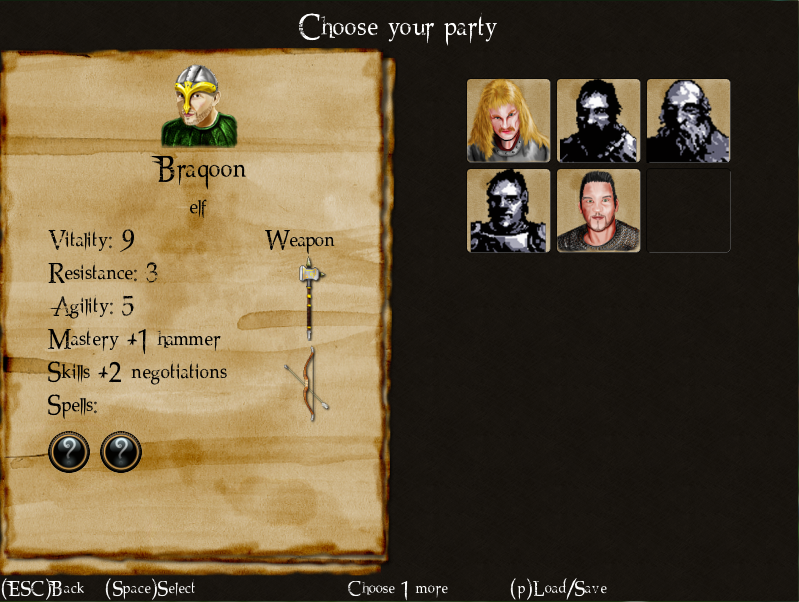 Once you have picked your six smeary face special people you arrive at the dungeon which looks basically like a roguelike game with tiles, except the player is a representation of more than one person because you’re a party. You use normal kind of keys to move one space at a time through the normal kind of dungeon. But OH MY CHRIST IT’S SLOW. There’s an animation of the next tile you can see fading in and a little pause. It takes freaking forever to get anywhere. It’s like each step in the dungeon is an event; a momentous occasion that we should sit down and reflect on. You can totally forget about any idea you had of holding a key down and having it repeat. You’re just lucky you don’t have to write an email to the developer each step you take. There are lots of doors. 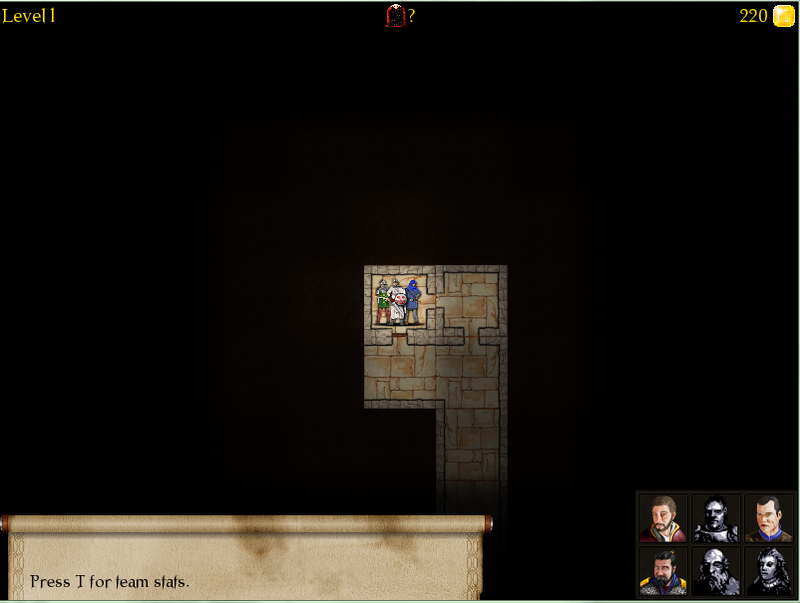 The doors are designed to slow down the hectic, breakneck pace of dashing down dungeon corridors. You have to select one of your poor melty face saps to more often than not take some damage as a result of opening the door. Inside a room you might be lucky and find nothing at all. Or there could be an exciting dungeon encounter, such as a bookcase that you choose a MFS (melty face sap- do keep up) to investigate. It will then probably collapse on him or her and cause them to take damage. If you’re really seriously unlucky then the hp losing event in the room will turn out to be a monster. You can bribe, negotiate with or fight monsters. At the start I tried being all Jean-Luc Picard and negotiating with everything but as so often happens in TNG too, it was a waste of time and you should just attack them on sight. Maybe bribing works sometimes I really don’t want to play the game again to find out. So: combat. Your six MFS vs. 1, 2 or perhaps later, even more monsters. Baddies please to stay behind line on top of screen; goodies please you stay below line in bottom of screen. You have a fighting phase and a moving around phase. The only reason to move around it seems is if you can’t reach a particular baddie with your goodie. I really don’t advise moving people around though. It seems you get stuck in a confusing world of moving people and it’s very hard to get out of. I have since learned that there’s a requirement that you fill the front row with your people if you can so that could be it. HERE’S AN IDEA, DEVELOPERS! WHY NOT PUT AN ERROR MESSAGE ON THE SCREEN SO WE KNOW THIS IS WHY WE ARE STUCK IN THE MOVEMENT PHASE! HEY? HEY? USELESS. Anyway combat continues until either you are all dead, the monster is dead or the player is dead of boredom or self-inflicted keyboard wounds. Then you move on through the dungeon. You may find stairs, in which case you can descend to another level of the dungeon where different badly-drawn things will feature in the combat section and maybe even different things other than bookcases will collapse on you. Magic seems not to be implemented yet. It would have made it better I think. Unless the spell effects were hilariously-badly-drawn of course, or the spell animations were tediously long in which case I suppose it could have made it worse. I’m sure they would have found a way to make it worse. What makes the game even worse anyway is the fact that it constantly just quits. It’s not a crash- it just exits with code -1. Nice. This is not a rare occurrence either- it’s rare to be able to make it to the 2nd dungeon depth. I think what really annoys me about games like this is what I perceive as the arrogance of the developers who seem to truly believe that what they have created is worth selling. It’s not. Well, commercially it might be, if all the reviews on Desura (a third of which give it 10/10) are not by family and friends. Incidentally, lots of these reviews say things like they are giving it a higher score because it has potential and it’s an alpha and it’s not fair to criticise it too much as it’s not finished. Well, by the same token, it’s not fair to charge money for it either. The developers of games like this have the wrong priorities. If I had a game in this sort of state, which represents maybe a week’s worth of work (see the many 2013 7DRLs if you don’t believe that, a lot of them are a lot more fun than this game and they are free), then I would carry on working on the basics. I would add the magic system and the items and leveling up or whatever- all that basic stuff. 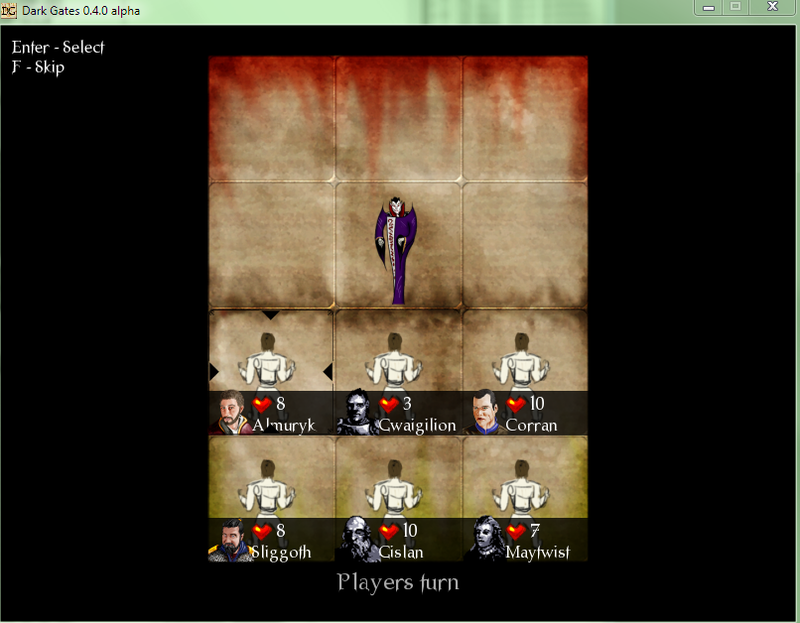 Instead, the developers here have added music tracks, sound effects, annoying animations and so on. Maybe it’s because the person doing the graphics and the person doing the music are separate people to the ones doing the coding. I hope the graphics dude is, because then you can replace him or her and get someone better. Everywhere, faces would be safe again! I do feel a bit guilty having a go at the graphics because someone has put work into them and will be perhaps hurt at my comments, but then they are selling this game for a not inconsiderable sum, and I feel I have the right to judge it. Bad graphics, slow, irritating animations and gameplay, shallow, simplistic gameplay, very frequent crashes. It is offensive that any amount of money is being asked for this game, let alone the relatively high price they have set.